After the shutdown of Braniff in 1982 a small group of Braniff employees led by Captain Jim Olsen approached local Twin Cities tour operator MLT Vacations about dedicating a Boeing 727-200 to the tour operators leisure destinations. Previously the tour operator had occasionally utilized a Braniff 727-200 overnighting at the MSP station for charters to leisure destinations. 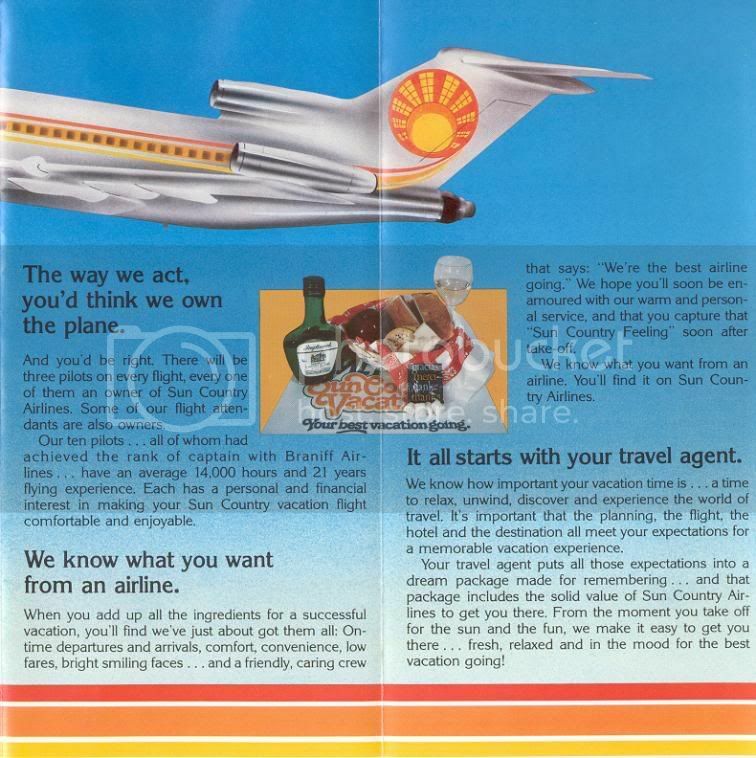 In June of 1982 a agreement was signed with MLT Vacations owning 51% of the new airline Sun Country with the pilots and flight attendants owning the remainder. An Air Florida 727-227 Advanced aircraft that had been destined for delivery to BN as 484BN was secured for the initial start-up. Sixteen pilots, Sixteen flight attendants, three mechanics and one office person formed the new airline Sun Country Airlines. Daniels and MLT CEO Warren Phillips, retained 51 percent of ownership. Eleven Braniff pilots, two cabin attendants, an attorney, and a financial consultant shared the remaining 49 percent. Sun Country Incorporated in 1982, but delayed start-up until 1983 due to costs. The companies first flight was January 30, 1983 from Sioux Falls to Las Vegas. The company quickly became profitable, within six weeks, and was able to pay back MLT's loan within eight months. Net income was $180,413 for the first fiscal year and $1.47 million for fiscal 1984. Headquarters were less than glamorous. Sun Country operated out of an old freight building. That space and the rented hanger had once been Braniff's--the defunct airline frequently housed planes overnight at Twin Cities International, then flew them out as charters. During the early days and from the top on down, Sun Country employees had multiple roles to perform. Company executives flew aircraft. Flight attendants acted as receptionists and baggage handlers in a pinch. Pilots updated manuals and even pitched in to clean the company's aircraft. To survive, Sun County and every other airline had to keep its seat per mile cost down. The seat-mile measurement was tied to a number of factors. Key among them was the number of seats being filled. During the first three-and-a-half years of operation Sun Country's average load exceeded 90 percent, thanks to MLT. The travel company purchased seats from Sun Country, packaged the air travel with hotel and a variety of other services, and then sold the packages via travel agencies. Consequently, Sun Country had no marketing costs, and by leasing its aircraft, terminal, and office space, the tiny airline kept debt service costs off its books. A slow and deliberate expansion through the 80's meant steady profits for the company. In 1986 the company put into service its first wide body aircraft, a 380 seat DC10-40 leased from Northwest Airlines. The aircraft's intercontinental range enabled the company to fly international charters and also accommodate demand on the heavily traveled MSP-LAS route. In late 1988, Midwest banker B. John Barry purchased majority ownership of Sun Country from the original investors. Publicity shy Barry, who owned 12 Minnesota and Wisconsin banks with combined assets of $530 million, maintained a low profile over the next several years. Sun Country's bottom line had also been aided by a decline in the number of charter companies. About 15 carriers had been in operation during the mid-1980s, but only a handful remained viable, including American Trans Air (Indianapolis), Tower Air Inc. (New York), and Key Airlines Inc. (Georgia). Sun Country was the third largest charter airline in the United States. Historically, Sun Country had expanded conservatively, a practice which had helped the airline weather the industry downturn. The company had no long-term debt. Barry, encouraged by the year's growth, pushed forward with an aggressive expansion plan. He intended to add two DC-10s and four or five 727s to the aircraft already in service. 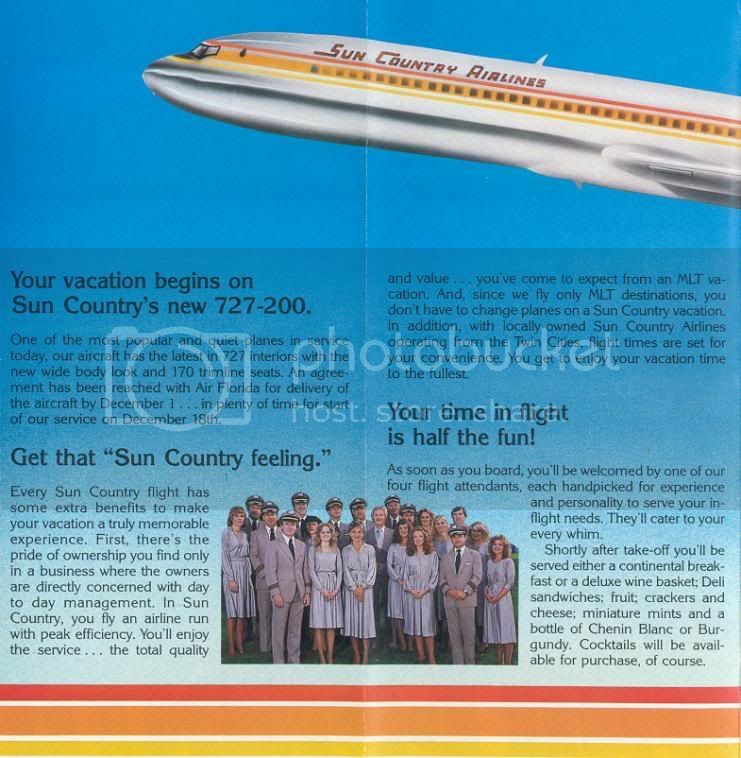 Sun Country also provided ad-hoc charter lift to civic organizations, corporations, sports teams or virtually any group that wanted to charter an aircraft. 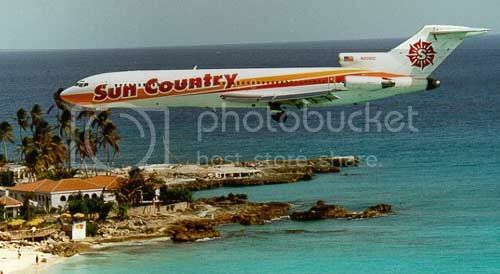 Sun Country became a member of the CRAF (Civilian Reserve Air Fleet) in 1989. Many charters were flown in support of the Desert Storm effort in 1990-91. 130 of the company's employees were recognized for their efforts by the Air Force. Thanks largely to military charters, Sun Country's revenue increased by 38 percent to $109 million, and net income more than doubled to $9.7 million for the 12 months ending June 30, 1991. Buoyed by record profits of $9.7 million for the fiscal year ended June 30, 1991 the airline acquired more 727 and DC10 aircraft. New tour operators were brought onboard with an emphasis on flying from the Midwest to Las Vegas, Florida, Mexico and the Caribbean. In early March 1996, Sun Country moved into direct competition with Northwest by offering discounted summer fares to locations such as Boston and J.F.K. in New York. Sun Country hoped Twin Cities travelers, who, according to American Express Domestic Airfare Index, paid 25 percent more than the national average for flights, would flock to their gates. Northwest, which controlled 80 percent of the Twin Cities air market, was quick to respond to the challenge. The giant airline slashed its fares. Sun Country had to reduce its fares, thus putting their profit margins in jeopardy. In August 1996, Sun Country announced that it had lost 50 percent of its MLT business for the 1996--97 winter vacation season. The airline said that the cut-back was related to the reallocation of resources to scheduled flights. The business with MLT had been producing 25 percent of the charter company's annual revenue of more than $200 million. In 1997, The La Macchia family bought the carrier, and appointed Bill La Macchia, Jr. as President and CEO. As the scheduled airlines became more sophisticated in managing their seat inventories in the late 90's the demand for charter flying by the tour operators fell off. In 1999, La Macchia decided to turn Sun Country from a charter airline to a fully scheduled carrier. SY was operating 727s and DC-10s on more than 100 flights per week to 21 destinations when it went scheduled. Sun Country made its first foray into scheduled flying with mixed results. Competing head-on with the local incumbent carrier Northwest resulted in losses for the company and the events of 9/11 meant a precipitous drop in traffic and revenue. SY also took on additional debt when it aquired New generation 737s from Boeing. The company closed its doors on December 07, 2001. The La Macchia's did not give any employees prior notice, and thus was subject to lawsuits under Minnesota's "6 week notice" law. A new group of investors and a new management team (including original founders Jim and Joan Olsen) were brought in to restart the airline. Those first months in 2002 harkened back to the beginning days of Sun Country in 1982 and the "Can Do" spirit of the company's work force. Sun Country, as MN Airlines, re-emerged stronger than ever in April 2002 with an all-new fleet of 737-800s. Jim Olsen lead the airline for awhile, then stepped into the Chief Operating Officer role, leaving the Presidency open to Shaun Nugent. On Halloween, October 31, 2006, Alleged Criminal Tom Petters bought a 49% share in SCA. In November, after former President and COO Jim Olsen stepped down, Petters Group Worldwide bought out "Whitebox" Advisors which owned 51%. "The Petters Group" took over 100% of Sun Country. The current President, Stan Gadek, was named in 2007. 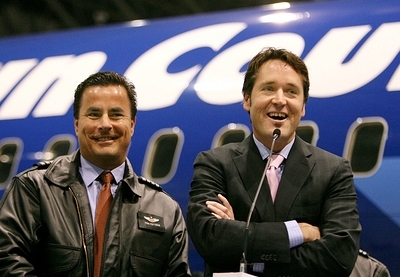 In April 2008, Sun Country laid off 100 station personnel, 28 Executives and furloughed 45 pilots. Over 90 flight attendants took a "leave of absence." The staff reduction was due to the enormous costs of Jet-A fuel which has risen to almost $4 a gallon. On September 29, 2008, SCA annnounced a pay-cut of 50% to all remaining employees. (Although, due to better profits in October than expected, the company reduced that to 30%) Also, Tom Petters resigned as head of "Petters Group" after the F.B.I. found out he had been allegedly "siphoning" over $3 billion. He was arrested at gunpoint at his home in Minnesota on Friday October 3, 2008. Petters was convicted of all counts in 2010, and is expected to spend the rest of his life in prison. The Government seized over $1 Billion in Petters assets, but left Sun Country alone. The carrier filed Bankruptsy on October 6th, as a result of the Petters scandal. President Stan Gadek turned the airline into a profitable carrier in 2008 and 2009. Thomas Joseph Petters in jail where he is likely to stay. The airline made money in the Fall of 2008 despite the Petters scandal. Sun Country once again had contracts with the military providing charters between Air Force bases in the U.S. Also, the "Laughlin" Charters added additional revenue. In December 2008, Sun Country was granted operating capital from the trustee of Petters Aviation to keep the airline flying. The money came from an Airbus deposit refund. On Christmas Eve, Stan Gadek, President, annouced a full restoration of employee salaries. Back Pay was also included. Sun Country entered 2009 as a profitable airline. and are now in service. In April 2009 , the carrier posted an unprecedented $8 million profit. Sun Country was one of two carriers to open the multi-million dollar Branson, MO airport in 2009. However, due to low demand, service was halted in December. In 2011, Sun Country continued to grow adding additional routes and aircraft. The airline also exited bankruptsy, and is one of the most profitable small carriers in the U.S. In July 2011, Cambria Group of MN bought Sun Country, but was sold to a Venture Capital firm who hired Allegiant Airlines former CEO. In 2018, they outsourced all SY employees, and hired a contract firm. This had led to a decline in Sun Country's core values. The future goal of this once "Braniff formed" airline is to emulate Spirit and Allegiant. The future is uncertain, but "The Braniff Spirit" is slowly leaving this once "hometown" airline of MSP. Photo taken at The Braniff - Mid-Continent Reunion 2007 in St. Paul, MN. © 2018 "The Braniff Pages"